Marylee: She saw the end of a marriage - and the beginning of a love affair. Kyle: You're a filthy liar. Marylee: I'm filthy, period. But you don't have to take my word for anything. Just try keeping your head clear, and your eyes open. Kyle: Why should you care? You never cared about me. Kyle: Why are you putting your two cents in? Marylee: Only because of Mitch. Because I've never had him. And your wife has. When Written On The Wind was originally released, most people referred to it by its initials: WOW. And WOW is exactly what I thought after seeing it. The story of a Texas oil magnate and the debauchery of his children that destroys them all, the movie may be the most effective of all of Douglas Sirk's melodramas. The powerful performances, intricate directing, and overflowing emotional wallops keep the movie fresh and meaningful. And besides, we all like to see spoiled rich kids taken down a notch or two in salacious ways, even if we won't admit it. Mitch Wayne (Rock Hudson) and Kyle Hadley (Robert Stack) have been best friends since they were small children. Mitch is always picking up after Kyle, who is the irresponsible, immature, chronic alcoholic son of Jasper Hadley (Robert Keith), an oil millionaire. One day, Mitch meets Lucy Moore (Lauren Bacall), and immediately takes a liking to her. He brings her with him when he meets up with Kyle, who sweeps her off her feet and marries her before Mitch can express his feelings. Kyle shapes up for a year, but his world falls apart when he finds out he may be sterile. Meanwhile, Jasper's daughter, Marylee Hadley (Dorothy Malone), is deeply in love with Mitch, but Mitch treats her as if she were his sister. Distressed by this, she conspicuously picks up men to gain attention from Mitch. When Marylee finally realizes that Mitch is in love with Lucy, she suggests to Kyle that Mitch and Lucy are having an affair, so when Lucy finds out she is pregnant, Kyle assumes it's Mitch's child, and takes drastic actions. In description, Written On The Wind sounds like an epic episode of Dynasty (which featured Hudson), but the four main actors' stunning performances and Douglas Sirk's complex directing style elevate the movie to the level of high art. Both Robert Stack and Dorothy Malone were nominated for Academy® Awards for their portrayals of the Hadley offspring, and Malone won hers; she manages to lace her entire performance with a thinly-veiled sexuality. If Stack is remembered for anything other than Unsolved Mysteries, it will most certainly be for his bravura performance here. Since Rock Hudson ascended to stardom on the covers of teen magazines and his physical attributes, reviewers dismissed him as wooden in his early career. It was around this time that everyone started to realize how strong an actor Hudson was, and while most of the credit is given to his performance in Giant, his acting here is almost as strong. Hudson is great as the long-suffering Mitch, a intricate role that he plays with a fine subtlety. The weakest of the four is Bacall. Mind you, she's not bad, but compared to the other stellar performances, her job seems to be more standing around looking pretty as opposed to intense acting. Of course, that's the way the character and story were written, so it's not really Bacall's fault. How Douglas Sirk wasn't nominated for an Academy® Award is a mystery to me. Sirk added a level of complexity heretofore unseen in the Hollywood melodrama, and rarely seen again with such style and density. Consider the colors: Kyle Hadley always wears gray, drab colors; Mitch Wayne always wears earth tones. I observed that, near the beginning, Lauren Bacall wears colors closer in style to Kyle. As Kyle alienates her, her colors change to complement Mitch's. And Marylee wears three colors: red, white, and black. The red represents her suppressed lust and sexual tension. The white represents her supposed purity, but we know it's false because her underclothes are black; ironically, she redeems herself while wearing all black. Many shots are seen through windows that create physical barriers parallel to the characters' emotional ones, or or involve mirrors as a device to show the characters what we already know—that they are despicable. Sirk's pacing has a musical quality to it; the lulls and climaxes fit the traditional three-act aspect of most films, but here they create a rhythm separate from normal filmic conventions. One scene that is of particular importance, both within the story and cinematically, is Marylee's dance in her room, representing the release of repressed sexuality. She dances with a picture of Mitch in her arms, in much the same way a man might use a pin-up girl in the bathroom. The scene shows just how effective Eisenstein's montage method could be: the tension is not created through any actions of the characters; rather, it is built by the contrast of Marylee's dance and her father's ascent of the spiral staircase. And considering that in the previous scene, Jasper learns about his daughter's orgiastic nature, the dance sequence can be seen as his unwillingness to accept her sexuality; in a very real sense, it overpowers him. The cutting suggests that it is this new knowledge that pushes him back down the staircase, as surely as if Marylee had done it herself. It is interesting to note that with all the complexity given to the pacing, story, and characters, the music is what you would expect from a generic melodrama. That is, the score is big and bold, played to heighten the tensions and emotions of any given scene—there is no subtlety in it. If the purpose of the music is to portray the emotions seen on screen, then it is extraneous, because the emotions are there for us to see and feel. And if you consider the music-like qualities of the flow of the film, the actual music becomes that much more useless. However, unlike most scores, this one does not feel like an intrusion. It's as if the music simply rides on top, and while we notice it, we don't pay it much attention as we explore the rich vistas provided in the images and performances. Image Transfer Review: This transfer is a wonder to behold. Certain exterior wide shots have some grain, but on the whole, the film looks spotless. Not only spotless, but highly detailed. If I didn't know any better, I'd say some of the scenes were shot this year. The colors are all rich and vibrant; the red of Marylee's car practically bursts from the screen. But all the colors are stable, and there is no bleeding. This transfer really shows the benefits of Technicolor. For a movie from 1956, I have to say that it looks absolutely spectacular. Audio Transfer Review: Presented in its original mono, the soundtrack sounds pretty good. There's no hissing or any other distracting white noise on the track. The music gets hit the hardest; I don't know what it is, but these mono mixes always make the music sound like the instruments are out of tune. I've heard better and worse mono mixes. Extras Review: The most substantial extra on the disc is The Melodrama Archive, a highly informative text supplement that chronicles Douglas Sirk's career. Split into three sections (Germany, America, Universal), the archive gives us a general history of each of the three periods, then examines key films, with comments from Sirk and supplemental photographs. It's all rather time consuming, but for a well-studied history of Sirk, this is the first place to go. In the booklet that accompanies the disc, there is a short essay on some of the complexities of the picture by film theorist Laura Mulvey. 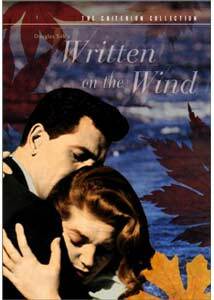 We also get the original theatrical trailer for Written On The Wind, as well as one for All That Heaven Allows, another Sirk film that Criterion has released. A sheer masterpiece, Written On The Wind is a complicated, multi-layered film, which allows the casual filmgoer to enjoy it as much as a film scholar. Highly recommended.